Pour the Curries By Nature Butter Masala over 1.5lbs Chicken (marinated and grilled). Next sauté for 5 minutes. Then add 2 cups of water to it and simmer for 10 minutes, occasionally stirring. When the Butter Chicken is ready, garnish it with creme or butter. Take the boneless chicken add 1 tbsp ginger -garlic paste, 2 Tbsps plain yogurt, some salt, red pepper and a tbsp of olive oil. Keep the chicken for about 3 hours and then grill it at 375 F for 10 minutes. The grilled chicken is ready to be added to the Butter Masala. Special touch-Chop some bell pepper and add to the Butter Chicken while it’s cooking. Serve with Naan, Basmati Rice or Roti. Sauté the Chicken over the Tikka Masala in a pan for 5 minutes. Add 2 cups water to it and simmer for 10 minutes. The Chicken Tikka Masala is ready. Garnish it with some cilantro/coriander leaves! Serve it with Naan, Roti or Basmati Rice. Add 1.5 lbs. Chicken in Curries By Nature Korma Masala in a pan .Sauté for 5 minutes . Add 2 cups of water to it and simmer for 10 minutes, stirring occasionally .The simmer time for Lamb will be more ,as it takes more time to cook. Garnish with some mint leaves. Serve the Chicken /Lamb Korma with Naan/Roti or over Basmati Rice. Sauté Makhane in a tablespoon of olive oil .Add these Makhane to 1 cup of Peas and pour in the Curies By Nature Korma Masala jar .Now add water to it and simmer for 10 minutes. Garnish with some green cilantro /coriander leaves. Tastes good with Naan ,also over Rice. Add Chicken and a jar of Jalfrezi Masala together in a pan . Sauté for 5 minutes. Add bell peppers and 2 cups water to it .Simmer for 10 minutes .Chicken Jalfrezi is ready! Chicken with bones in will take some more time to cook than the boneless chicken. Special Touch-To give it a Chinese twist add a tsp vinegar and soy sauce each ,to the prepared Chicken Jalfrezi. Serve with noodles or fried rice. 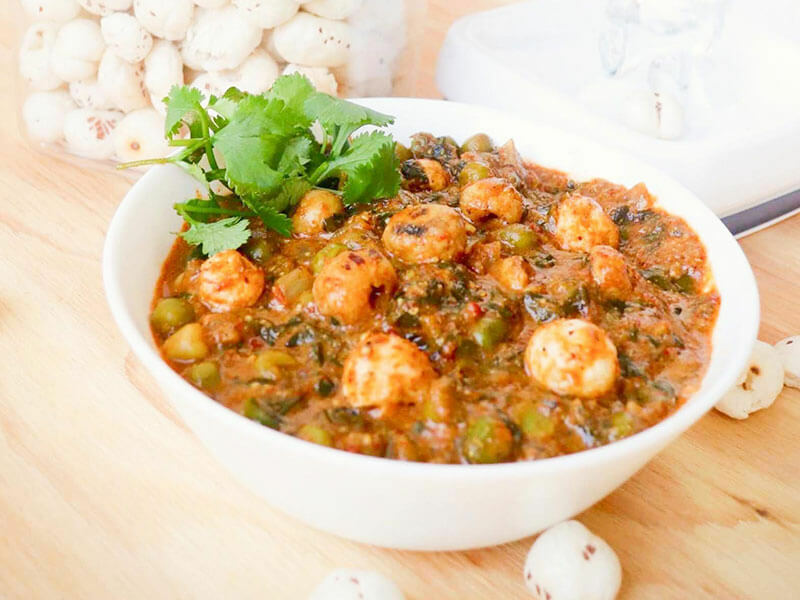 Pour the Curries By Nature Butter Masala in a pan and add the Paneer to it. Sauté the Paneer in the Butter Masala for about 2 minutes and then add 2 cups water . Simmer for about 10 minutes. Garnish it with some creme or butter. Special touch-Add some bell peppers to it while it’s cooking.. Serve with Naan ,Basmati rice or Roti. Add Panner to the Tikka Masala in a pan and sauté for 2 minutes. Then add 2 cups of water to it and simmer for about 10 minutes. The Paneer Tikka Masala is ready .Garnish it with some green cilantro/coriander leaves! Serve it with Naan ,Roti or Basmati Rice. Mix the Vegetables and the Korma Masala in a pan .Sauté them for about 5 minutes. Add 2 cups of Water to it and let it simmer for 10 minutes. Nav Ratan Korma is ready. Garnish with some cashews and some green cilantro/coriander leaves. Serve with Naan/Roti or over Basmati Rice. 1 lb Meat(Goat/Lamb/Beef)-boneless and diced. Marinate the meat in a cup of plain yogurt for about 3 hours. Once marinated, add the meat to the Curries By Nature Vindaloo Masala in a pan. Sauté for 10 minutes. Add water slowly while stirring occasionally. Cover and simmer for about 30 minutes or until the meat is fully cooked. Serve with Naan/roti or Rice. Cook time varies with different kinds of meats. Special Touch-You can use ground meat also instead of pieces. It will take much less time to cook. Add Paneer and the Jalfrezi Masala together in a pan. Sauté for 2 minutes. Then add bell peppers and 2 cups water to it and let it simmer for 10 minutes. Special Touch-To give it a Chinese twist add a tsp vinegar and soy sauce each ,to the prepared Paneer Jalfrezi. Serve with noodles or fried rice.